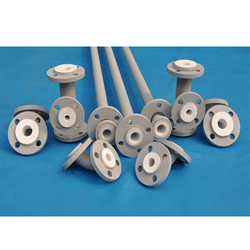 Manufacturer of a wide range of products which include ptfe lined elbow, ptfe linings, pipe lining, ptfe lining coating pipe joints, ptfe lining and coating and reducers lining. 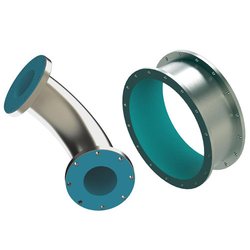 We are one of the glorious manufacturers, suppliers and exporters, engaged in presenting PTFE Lined Elbow. Made available in different specifications, these ruggedly constructed elbows are highly demanded among our valued patrons. 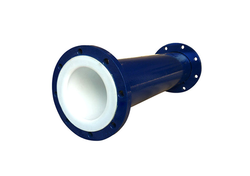 PTFE lined elbows are manufactured as per the existing industry standards to ensure flawlessness. 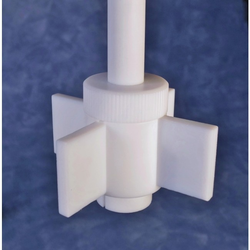 Being one of the eminent manufactures, exporters and suppliers, we are involved in presenting PTFE Linings that are made from supreme quality PTFE material, procured from our vendors. Owing to the rugged construction, longer service life, ease of setting and high resistance to chemicals, these linings are vastly demanded. Manufacturer of a wide range of products which include valve lining, reducers lining, ptfe lined elbow, joint lining, vessels ptfe lining and ptfe linings. We are one of the trustworthy manufactures, suppliers and exporters of Valve Lining that can be acquired in different thicknesses to meet the varied clients requirements. Manufactured from optimum quality raw material, these linings are vastly admired among our clients. Before the final send off, the lining is checked for its perfection. 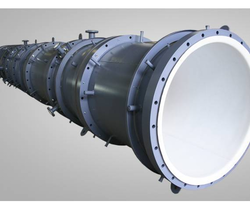 We are one of the distinguished names of the industry that manufacture, export and supply Pipe Lining that is widely appreciated for its high resistance to chemicals. Vastly used for bigger and small pipes, these linings are highly acclaimed among our customers. During the manufacturing process, we make sure that all the set industry norms are followed. Our company is involved in manufacturing, exporting and supplying PTFE Lining Coating on Valves. Coating that is a highly non-reactive and pure thermoplastic fluoropolymer. Prepared by the polymerization of vinylidene difluoride, the proposed coating is highly acclaimed for its enhanced shelf life and accurate composition. We provide the coating in safe packaging. 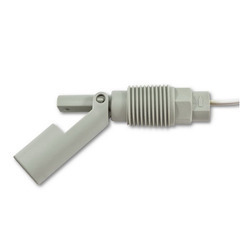 Our company is engaged in the manufacture, export and supply of PTFE Lining Coating Agitator that is processed using quality grade PTFE material that is obtained from our reliable vendors. The proposed coating is widely appreciated and accepted in the market for its supreme effectiveness, longer shelf life and chemical resistance. Our clients can acquire it in safe packaging. Backed by a team of skilled and experienced professionals, we are involved in manufacturing, supplying and exporting Reducers Lining. 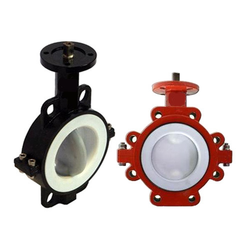 The proffered lining is manufactured from supreme quality raw material that is obtained from our reliable vendors. Owing to the tough construction, durability and chemical resistance, this lining is vastly admired. We are one of the noted manufacturers, exporters and suppliers, involved in presenting Joint Lining. Manufactured in accordance with the existing industry guidelines these linings are vastly acknowledge for their great ability of reducing corrosion caused by chemicals. T joint lining can be acquired in tamper proof packaging. Our company is involved in manufacturing, exporting and supplying PTFE Lining Coating on Valves Coating that is a highly non-reactive and pure thermoplastic fluoropolymer. Prepared by the polymerization of vinylidene difluoride, the proposed coating is highly acclaimed for its enhanced shelf life and accurate composition. We provide the coating in safe packaging. 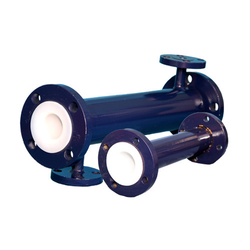 We are among the eminent names of the industry that manufacture, supply and export Vessels PTFE Lining. Manufactured as per the predefined industry guidelines, the proffered linings are highly acclaimed among our customers. 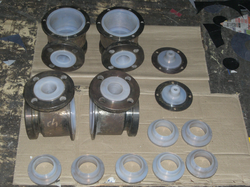 PTFE linings are provided in tamper proof packaging to maintain the quality. Our company is involved in manufacturing, exporting and supplying PTFE Lining Coating Valves .Coating that is a highly non-reactive and pure thermoplastic fluoropolymer. Prepared by the polymerization of vinylidene difluoride, the proposed coating is highly acclaimed for its enhanced shelf life and accurate composition. We provide the coating in safe packaging. We are one of the trustworthy manufactures, suppliers and exporters of Valve Lining that can be acquired in different thicknesses to meet the varied clients’ requirements. Manufactured from optimum quality raw material, these linings are vastly admired among our clients. Before the final send off, the lining is checked for its perfection.